Mór Irish Gin with a garnish of lime and raspberry went perfectly with the seered scallops, earthy at first, with coriander and rosemary and bundles of berry notes with a slight peppery hint on the finish. Next up… Drumshanbo Gunpowder Gin with a wedge of grapefruit as a garnish, botanicals include juniper, angelica, orris, caraway, coriander, meadowsweet, cardamom and star anise as well as lemon and lime and gunpowder tea! Rather delish with the lamb and vegetable curries and home made black onion seed naan. And for a refreshing dessert… Bertha’s Revenge Gin with a garnish of orange peel. A gin from Ballyvolane House named after Bertha, a Droimeann cow from Kerry, said to have been the oldest in the world when she died aged 48 years in 1993. The gin uses alcohol from Irish dairies as its base with botanicals including locally foraged sweet woodruff, elderflower and almond as well as cumin, cloves, cinnamon and cardamom, angelica and liquorice too. Delicious with the Cathedral Windows Jelly Dessert, vanilla ice cream and passion fruit and mango coulis. It was February 2016 when 3 couples came to stay to nose and taste and learn a little about Scottish Gin. And so, in the name of research we helped to gather information for a Gin Trail page on the Scotland’s Best B&B’s website. We call ourselves the Gin Musketeers! Our ever growing knowledge of Scottish Gin and yearn to learn more, led to a return in 2017 for our official opening of The Tasting Room ! Well, it seems befitting to invite our friends to return once again, now that we offer a Gin Tasting experience to our Guests. So here we are for our Gin Musketeers Mark III ! And, they all insisted on bringing food! And to round off the weekend… a lovely walk at Loch Mor, where salmon can be seen swimming up the salmon ladder to spawn. A little further across the boggy moorland takes us to the sand dunes beside the loch. Frogs abound in the streams, flying swans and a glimpse of a lone fisherman hoping to catch a salmon on his favourite Beat. 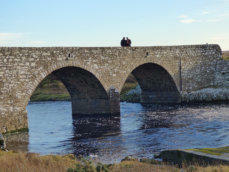 A good number of Beats to choose from, with 26 miles of the best salmon fishing from Loch Mor to the river at Thurso. And finally to end the weekend, a delicious lunch at The Ulbster Arms, Halkirk, cooked for us by Craig, the best young chef in the county… and home again for coffee and Irene’s delicious home made Scottie dog shortbread and tablet. Safe travels are wished to our friends Sue and Stewart at Home Farm B&B in Muir of Ord, thank you for the delicious scallops Sue. And oh so tasty lamb and vegetable curries, cooked by Gordon and super gorgeous home-made naan by Carol from The Dulaig B&B, Grantown-on-Spey. Thank you for sharing your recipe Carol! And all the way from Tillicoultry, Terry and Irene’s oh so light and crumbly shortbread and fabulous tablet from Wyvis Boutique B&B. And of course, more gin flowed in The Tasting Room… we’re delighted to say they all survived to breakfast !